PORTLAND, OR, USA, December 6, 2018 /EINPresswire.com/ — Breakside Brewery, known for its innovative, experimental and diverse beers, is hosting two giving trees for the month of December at its Slabtown location (1570 NW 22nd Ave, Portland, OR 97210). Donations are being collected for New Avenues for Youth, a local nonprofit organization dedicated to the prevention and intervention of youth homelessness. "We are grateful for Breakside and their continued dedication to our mission of ending youth homelessness. Their support extends far beyond our signature event Brews for New Avenues – they are stepping up and mobilizing the beer community to make a direct impact on the lives of youth through the support of their holiday giving trees. The donations collected are items that are critical to youth being able to stay safe and warm on the streets while they move deeper through our services aimed at helping them exit street life." The mission of New Avenues for Youth is to work in partnership with the community to prevent youth homelessness and provide young people experiencing or at-risk of homelessness the resources and skills needed to lead healthy, productive lives. Breakside Brewery has supported the organization in the past with gift donations and special event, and is expanding support this holiday season with giving trees on each floor of its Slabtown location. Visitors can select tags and donate gifts to kids in need. There may even be a visit or two from Santa for kids and the over 21 crowd alike! Breakside Brewery’s Slabtown location is open from 11 am to 10 pm Sunday through Thursday, and closes at 11 pm on Friday and Saturday. 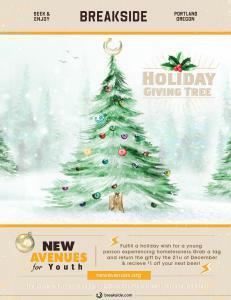 Gifts for New Avenues for Youth will be accepted until closing on December 23rd. More information by calling (503) 444-7597.